Gaming for all? The new Sandy-Bridge processors from Intel do not only bring about a performance gain in CPU-oriented calculations. Now the improved integrated graphics chip is also available in the Quad-Core CPUs. The HD Graphics 3000 should reach the performance level of hitherto existing entry-level graphics cards. Are games possible too? Our detailed gaming tests will reveal it. So far, laptops using Intel's integrated graphics solutions, i.e. the Graphics Media Accelerator (GMA) HD in the Arrandale chips or the GMA GMA 4500M HD chipset graphics of the previous Penryn systems, were designed for typical office tasks. They proved to be sufficient for displaying the desktop in 2D, watching HD films and even simple games. At the same time there was also a trend to laptops with dedicated graphics card, which, besides 3D-calculations, also took over more and more other tasks, e.g. (de)coding of videos, and could therewith disburden the CPU. However, also the requirements of games increased continuously. and the Intel HD graphics 3000 GPU can be used together with an Nvidia graphics card by means of the Nvidia-Optimus technology (later this year perhaps also with a similar AMD solution). In our test we used a laptop with Optimus solution, the Asus N53SV. Its detailed review is available here. This article covers the performance of the HD Graphics 3000 inside the Intel Core i7-2720QM CPU. In addition, a desktop reference system with Core i5-2500K and also HD Graphics 3000 was available for further tests. Contrary to the GMA HD, Intel HD Graphics 3000 is directly integrated in the processor core of the Sandy-Bridge processors. Alike its predecessor it does not have a dedicated graphics memory, but, can access the Level-3 cache of the CPU (which is now called 'Last Level Cache' - LLC) of up to 8 MB, depending on the CPU. Further memory requirements are covered by accessing the RAM of the computer. Alike the actual cores of the CPU, the integrated HD Graphics 3000 can dynamically adjust its clock rate upon increased load (Turbo Boost). However, some processors of the Sandy-Bridge family handle this feature differently. E.g., the clock rates range from 650 MHz to a maximum of 1300 MHz in the new i5/i7-2X20 or i5/i7-2X40 M/QM/XM processors, while the i3-2310M and also the i7-2630QM use a clock rate between 650 and 1100 MHz and the i5-2410M and the i7-2635QM between 650-1200 and are therewith lower clocked. ULV processors, e.g., the i7-2617M have an even lower clock rate of 350 to 900MHz, so, the performance should drop accordingly. The Intel HD Graphics 3000 has 12 Execution Units (comparable to pipelines). Despite the same number than in the GMA HD, they have been improved and are now clearly faster than in the predecessor. Furthermore, the HD Graphics 3000 got a unit dedicated to decoding and encoding of HD videos. In addition it supports DirectX 10.1, Shader Model 4.1 and HDMI 1.4 (support of 3D displays). Just like the whole CPU also the graphics unit is manufactured in 32-nanometer lithography. The Intel HD Graphics 3000 in the Asus N53SV (Optimus) is responsible for the results of the following benchmarks tests. As its clock rate ranges from 650 MHz to 1300 MHz the results should show the upper performance limit of this graphics solution. First we run the Cinebench R10 Shading Test (64bit). Here our test system with HD Graphics 3000 achieves 5960 points. This is only marginally less than with active Nvidia Geforce GT 540M graphics card (6132 points). The top value of the GMA HD in our database stems from the Sony Vaio B11 with Intel i5-520M CPU: 2169 points. Its predecessor, the GMA 4500M HD achieved a maximum of 1122 points (Fujitsu Lifebook A1130, T6600 CPU) in this test. Laptops with strong graphics cards like the ATI HD 5870 GPU (Asus G73JH) and even SLI-solutions (XMG8.c, GTX 280M) rank between 5900 and 6000 points. In the newer Cinebench R11.5, 11.41 Fps are achieved in the OpenGL test. After all, this is clearly less than the Asus N53SV (24.9) can do with active GT 540M. Again, the difference to the Intel GMA HD is impressive: The Toshiba Portege R700 with i7-620M CPU reached 1.9 fps in the same test, that is the best result of this graphics solution in our database. The GMA 4500M HD in the Toshiba C650 with T4500 CPU got 1.1 fps and is even slower. The integrated Intel graphics can also score points in the familiar Futuremark 3DMark tests. In the yet very CPU-oriented versions of 2001 and 2003, 17134 and 11589 points are achieved. In the more significant 3DMark 2005 it still gets a result of 8626 points. The best result of a GMA HD of 3429 points in our database stems from the Dell Studio 1558 with i5-520M CPU. In the best case, the older GMA 4500M HD - to be specific the Thinkpad T400s with SP9600 CPU - reaches 1665 points. In the newer 3DMark 2006 (1280x1024), our test system accomplishes 5275 points with HD 3000 and 8423 points with active Geforce GT 540M. A maximum of 1968 points is recorded for the GMA HD (mySN MB6, i5-540M CPU) in our database. The best value of the 4500M HD of 998 point is again from the Thinkpad T400s. As a last challenge we execute the current 3D Mark Vantage, which displays 1387 points for our Asus N53SV test system with Intel HD Graphics 3000 and deactivated PhysX. Activating the Geforce GT 540M the result increases to 4458 points. The GMA HD Chip can score a maximum of 339 points, recorded for the Dell Studio 1558 with i5-520M CPU. Compared to the GMA HD, we could ascribe a performance gain of 170% in the 3DMark 2006 and up to about 300% in the 3DMark Vantage to the new Intel HD Graphics 3000 according to these benchmark results. Please note, the impact of the CPU is not taken into account. Generic benchmarks are one side, but how well do games run in practice? As Intel points out the increased 3D performance in games, we want to look into it in detail. Furthermore, it is necessary to deal with rumors that the integrated graphics chip should replace various entry level graphics cards. In the following we run a number of older and current games on our Asus N53SV test system, alternatively on active GT 540M graphics or on Intel HD Graphics 3000. During this somewhat older game the GT 540M GPU achieves an average of 107.6 fps (1024x768, high). 69.3 frames per second allow the integrated Intel Graphics 3000 to achieve a smooth image sequence too. 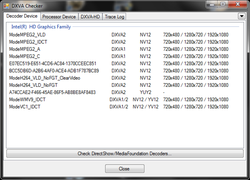 A glance at our gaming database reveals 23 fps for the predecessor, the GMA HD, at the same settings. This would mean a performance gain of about 200%. The Nvidia 310M achieves 42 fps, which is also clearly less. First, the GT330M reaches a result of 70 Fps and is on par at identical settings. During the test, a clearly too dark picture strikes us, when we run the game on the integrated graphics chip. With the current driver (8.15.10.2246) this is true for many games based on the Valve Source Engine (e.g. also Alien Swarm in our test). The Intel Graphics 3000 accomplishes an average of 18.79 pictures per second at high graphics details (1024x768, high) and is, so, slightly slower than the Geforce 310M (20 fps). Although the performance is too low for a smooth game play, the result of the GMA HD (6 fps) is again multiplied. At low graphics settings Farcry 2 also runs well on the Intel 3000 graphics solution: 62.67 fps. This value is again about on par with the Nvidia Geforce 310M. The GMA HD achieves about 53 fps, the GMA 4500M HD 32 fps. In the demanding Anno, the Intel Graphics 3000 achieves 8.8 fps and surrenders at high presets (1280x1024, very high). Although you cannot play Anno at these settings, the integrated graphics chip from Intel indeed reaches the level of entry-level GPUs, which are at 9 fps (Geforce G210M) or at 10 fps (ATI HD 5470) not really faster. At low graphics details, the HD 3000 is back again and accomplishes absolutely playable 45.7 fps. This is about the rate of a Geforce G102M (48 fps), and definitely faster than the ION-graphics solution (19-42 fps). At high graphics details (1366x768, high, 0xAA) only 19.4 fps are possible and Need for Speed stays unplayable. Reducing the details to medium (1024x768, med) just brings about a slight improvement to 23.6 fps. A smooth game fun is only possible at lowest graphics demands (800x600, low), where we record 37.1 fps in the test. But, this value is already at the level of a Geforce GT 220M graphics (32 fps). The Intel GMA HD achieved a comparable result of 34 fps. The Intel graphics delivers 20.9 fps on average at high graphics settings (1366x768, DX10, high) and is placed on a level of the Geforce 320M or slightly above the G 210M in our ranking. It about doubles the 10 fps of the Intel GMA HD. At low details the performance increases to 58.4 fps in the benchmark test and a smooth game play should be possible. At high graphics details (1366x768, high) just 13.1 fps are possible in our test. This does not suffice a smooth game play. Nevertheless, the GPU still ranks in front of the G310M graphics from Nvidia (12 fps) and falls only slightly behind the Geforce 320M (15 fps). In comparison, the GMA HD only achieves 4 frames per second. So, the Graphics 3000 offers about the three times the performance of an Intel GMA HD. At medium detail level (1366x768, med) the average frame rate rises to 20.4 fps, at low graphics settings (1024x768, low) smooth 94.4 fps are reached. So, there is finally some leeway for optical improvements. Only at low details, COD-MW2 runs smoothly on the Intel HD Graphics 3000. We recorded 26 fps for the Intel GMA HD at low settings (800x600, low, 0xAA), which again means a huge performance gain of the Intel HD 3000. The integrated Intel HD Graphics 3000 does clearly worse in BFBC2 than in Modern Warefare 2. It only achieved 15.fps in our test (1366x768, high, 4xAF) and even at medium detail level the frame rate of 25.4 fps casts a smooth game fun into doubt (1366x768, med). When we ran multi-player combats, we experienced a juddering even at the lowest detail level. In comparison the Intel 3000 graphics solution again ranks in front of the Geforce 320M and the HD 5470 from AMD. Even at lowest detail level (800x600, low), the Intel GMA HD cannot do no more than 16 fps in BFBC2. The Intel HD Graphics 3000 achieved 17.9 fps at high details (1366x768, high, 2xAA, 2xAF) in our test. Therewith it stays outside the playable range, but at least in front of the G210M (17 Fps). Noticeable: Even at lowest detail level (800x600, low) the HD 3000 cannot exceed 22.7 fps on average in our benchmark test. So, CoD-Black Ops can probably not be played on the Intel HD Graphics 3000 at all. In addition, we also checked the gaming performance of the HD Graphics 3000 in the two desktop CPUs, Core i5-2500K and i7-2600K. Because of the CPUs' higher clock rates, they can mostly achieve slightly higher frames rates. Fifa 11 runs, e.g., on the 2500K system smoothly at high details. In Sims 3 medium details suffice smooth frame rates. Many further gaming tests of the mobile and the desktop version are available at our graphics page of the Intel HD Graphics 3000. Instead of the Execution Units, dedicated functional units are now used when decoding HD videos. This should make decoding more efficient. 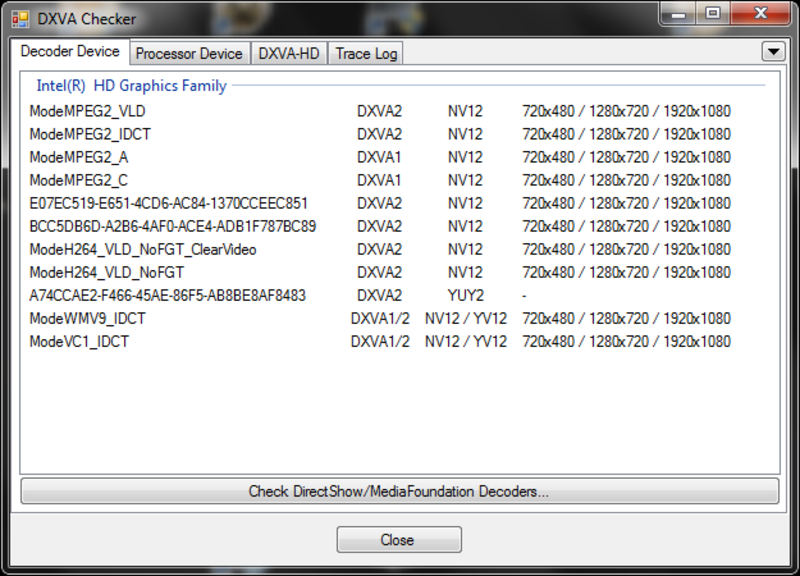 According to the DXVAChecker (see screenshot) the Intel HD Graphics 3000 (in the 2500K desktop processor) supports the complete decoding of MPEG2 and H264 (VLD entries). In VC1 and WMV9 the current driver only copes with IDCT decoding level. However, according to Intel, a complete decoding of VC1 should be possible (perhaps with future driver versions). Our tests results go conform with the readings from the DXVAChecker. Even if only one core of the i5-2500K is active and clocked at 1.6 GHz the H.264 coded Big Buck Bunny video (1080p) runs smoothly at 0.5% processor load. Playing back VC1 or WMV encoded videos we observe a clearly higher CPU load compared to a Desktop GTX 460 with PureVideo HD (VP4) decoding. The new HD graphics card inside the Sandy Bridge processors can not only decode HD videos, but also, and that's new, encode such (Intel Quick Sync). So, videos can be quickly converted into a different format and changing the bit rate and the resolution is swift. We ran our tests on a computer with Core i5-2500K desktop prozessor, 4 GB DDR3, Samsung HD103SJ HDD and using CUDA of a Desktop Nvidia GeForce GTX 460 graphics card. Because of the very fast desktop quad core processor (3.2 - 3.7 GHz) only Intel's reference tests show noticeable improvements. However, an important fact is that the CPU load is clearly lower when Quick Sync or CUDA of the GTX 460 is used. For test purposes we ran a 4 minute long 1080i example on MediaConverter 7 and on a trimmed down CPU. The 2500K clocked permanently at 1.6 GHz and could only use a single core. Therewith, the processor alone needed 444 seconds, and no longer only 57 seconds to convert the video. The CUDA performance stayed with 83s vs. 90s about the same. Using Quick Sync the task now took 26s instead of 14s. During our test of the Media Converter 7 (pre-sample) we converted a 5 minute 720p video in a YouTube compatible format. The 2500K quad-core desktop processor alone needed 101 seconds for this task. With Quick Sync the encoding was done clearly faster in 33 seconds. The conversion of a 4 minutes 1080i videos into an iPhone 3GS compatible format by MediaEspresso was even quicker. The CPU needed exactly 4 minutes and the decoding was done in just 14s with Quick Sync. To summarize, Quick Sync particularly scores in weaker notebook CPUs and in terms of energy demand. However, the performance of Quick Sync depends heavily on the used source and the selected destination format. H.264 coded videos are a strength of the Intel solution with the current drivers. The performance slightly drops at VC-1 and falls behind CUDA (using the powerful desktop GTX 460). The performance of the Intel HD Graphics 3000 can indeed be called impressive. In many older and current gaming titles it competes at a level of entry-level graphics cards like the Geforce G 310M, the GT 220M or the ATI HD5470. It multiplies the performance of the previous Intel GMA HD solution. In practice this means that older games can be played at high graphics settings and current games mostly at low graphics details. In our test we also noticed that some games did not run faultless on the Intel HD 3000 graphics. Obviously, software updates, which will hopefully be available in form of driver updates soon, are necessary here. E.g., there are problems with the brightness (Left 4 Dead 2 and Supreme Commander are too dark, Sims 3 and HAWX 2 too bright after changing the resolution) and Mafia II did not run at all. In comparison the drivers from AMD and NVIDIA are clearly more mature. Because of the outstanding performance of the new Intel Sandy Bridge quad core CPU, a positive impact of the CPU on the recorded results should be considered. On contrary, the reference laptops were equipped with Clarksfield and Arrandale chips. Concerning the integrated Intel HD Graphics 3000, you should keep in mind that it is - depending on the CPU - differently clocked. While the tested i7-2720QM CPU clocks the graphics chip at 650 up to 1300 MHz, the clock rate of the GPU only ranges from 650-1200 MHz in the i7-2635QM or from 650-1100 MHz in the i7-2630QM. In ULV processors the clock rate is even lower at 350-900 MHz. So, the performance drops accordingly. The same is true for systems with slender cooling capacities, because this might hinder the turbo function in achieving the maximum performance boost. Further benchmarks and gaming tests for various versions of the Intel HD Graphics 3000 can be found on the always updated graphics card page of the Intel HD Graphics 3000.